It's hard to believe, but there was a time before fancy Tanooki Suits, space-foxes and Lon Lon Milk defined a good game. It was an era without joysticks, Wii Remotes or Power Gloves. How could anyone possibly have had fun in such a world, you ask? Well, back then, people were satisfied with a simple pencil and pad of paper, and that was enough. It was a simpler time. Such activities still live on today next to the comics in your local newspaper, in big books with bright covers and, for those with less pocket space, in compilations like Nikoli's Pencil Puzzle. It carries the name of the Japanese publisher that helped popularise Sudoku, a game that's featured here alongside three of the company's own creations: Shikaku, Hashi and Akari. And, for the most part, it's quite the quality collection, albeit limited in scope. The four are all numerical logic puzzles that require deductive reasoning, and each feels significantly different from the others to complement them well. Sudoku has you fill in a grid of 3 x 3 blocks on a 9 x 9 board with numbers 1-9, not repeating a numeral in any block, row or column. Shikaku presents a grid of scattered numbers around which you're to draw boxes, the areas of which match the contained digit, without any gaps or overlapping sections. Hashi also lays out numbers on a grid and has you connect them by the amount of bridges represented by the numeral, allowing you to use one or two per line, until no digit stands alone. Akari works somewhat like reverse Minesweeper – again, numbers lay spread throughout a grid, and here you're supposed to place the amount of bulbs represented by each numeral next to it. These in turn shine a beam horizontally and vertically until it's stopped by a barrier, and you're to illuminate the board without two light paths crossing each other. The game includes helpful tutorials for each as well. The package crystallises well what makes such logic games fun – they're easy to pick up, simple to learn and subtly complex enough to make each round different from the last, and each is skilfully designed. 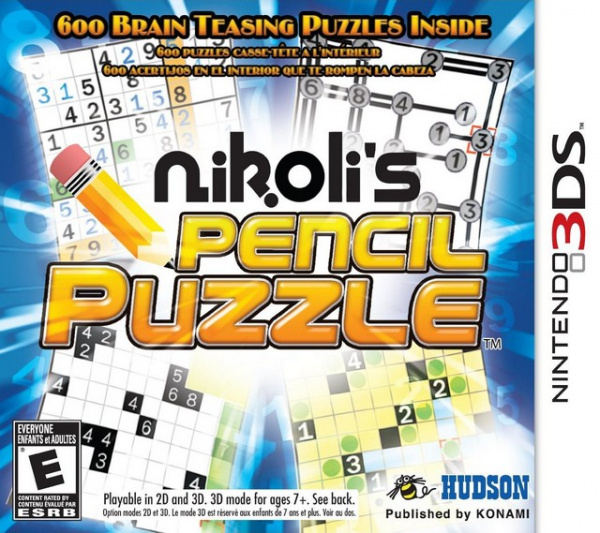 Quantity helps here as well, and Nikoli delivers with 600 puzzles in all, though the balance is somewhat off: there's 300 Sudoku, 120 Akari, 110 Shikaku and 70 Hashi grids, but that's still a significant amount in each category. You can also earn different coloured crowns depending on how fast you complete each puzzle, though the achievement requirements for Sudoku are a bit on the unreasonably demanding end. These are divided into four difficulty levels from Intro to Hard, and for the most part they prove accurate, though that's not always the story with the most prominent section, Sudoku. It's rare here to find a puzzle labelled Easy that fits the bill, and the majority of boards could easily pass for Normal or above. It's not a problem if you like a challenge, but we would have welcomed a more precise partition. Each activity allows you to utilise temporary markers, though oddly only Akari features the option of erasing them all at once. 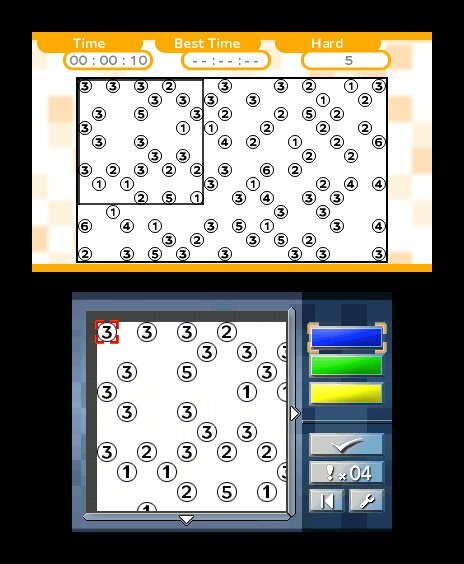 You can also only divide each Sudoku square into four guessing spots as well, which can become frustrating. Besides this game, they all let you make your mark in a few different colours, which helps when it comes to coding, say green for lines you're sure of and yellow for those of which you're uncertain. You can also earn hints – read: exact solutions to whatever spot on the grid you're selecting – by solving puzzles or spending Play Coins. 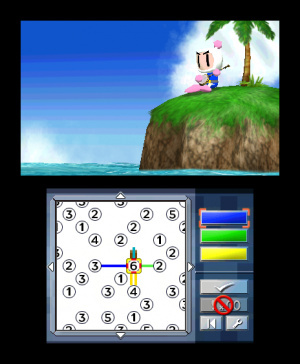 The music selection features a number of relatively catchy tracks, and you can alternate between them mid-puzzle. You can also pick between three options for the top screen: a view of the entire board, a clock or an animation specific to each game. Sudoku's is quite dull – a few repeating views of landmarks and, every once in a while, some spaceships. The others are more exciting: Bomberman blows up your Hashi bridges as you erase them; Milon navigates a museum as you light up and darken its corridors in Akari; and suspiciously Tron-like racing bikes criss-cross as you form shapes in Shikaku. They aren't exactly visual masterpieces, and all of them grow repetitive after a while, but at least they make for something somewhat interesting to see. Nikoli commits one very unfortunate misstep, however, especially considering the complexity of some of the puzzles and their required time commitments – you cannot have multiple games going at once. If you grow tired of one puzzle and want to try a different one, you can't come back to the first without starting from scratch, making the game, in this regard, less versatile than its paper-based alternative. You can exit and come back to a match, and three save files help out, but with separate best times and crown collections, they don't solve the problem except in a cutting-corners sort of way. While Nikoli's only contains four activities, they're fun and diverse enough to make this a good collection, and with 600 puzzles total, they'll keep you satisfied for a long time. Somewhat inaccurate Sudoku difficulty levels and the inability to have multiple puzzles going at once prove unfortunate aspects, and the presentation is somewhat bland, but anyone looking for some clean-cut, subtly complex logic-based fun could do worse than this. 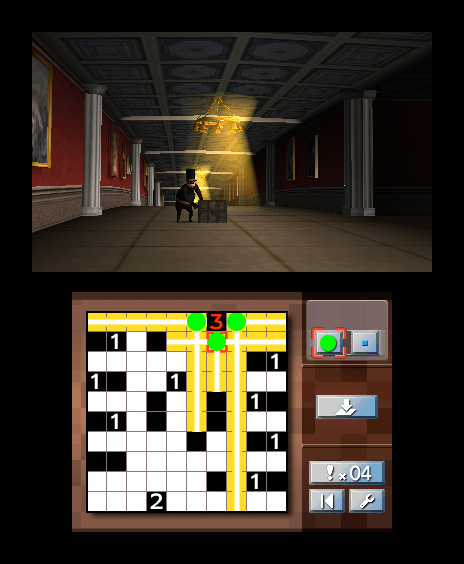 This looks the same as Sudoku: the puzzle collection which came out in Europe in June. They probably just renamed it for the American release. Had this game been a download game, I be playing it right now. Telegraph Sudoku+Kakuro had 500 puzzles for £1.80. This may have more diverse types of puzzles and higher production values, but 300 of this games puzzles are Sudoku anyway, and most people who want to buy a sudoku game don't really need fancy production, do they? Anyway, I recommend anyone who wants I Sudoku game to buy Telegraph S+K. Sad that this is the game the Hudson name goes out on. How about no. 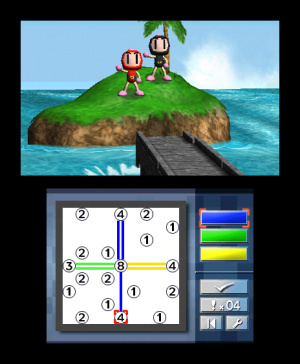 Bring on the Bomberman 3D. @Morpheel: I'm glad I'm not the only one! EVERY SINGLE TIME I see it in the store I have to take a double take. XD Did you ever play that Zelda clone Neopets game? I still to this day do not know if it was good or just so bad it became good. XD It's entertaining to say the least. Seeing bomberman only makes me want a bomberman 3DS more. C'MON! How much does this game retail for? It's not that I have problems with casual games (I had fun with Chicken Shoot Wii and Whack-a-Mole DS, for instance) but if they are trying to sell this at the same 39.99 price tag as the blockbuster titles, then they should rethink their pricing strategy. I am by no means a Sudoku fan (to me it's incredibly tedious), or a cards fan (some solitare card games are near impossible to win) but I do enjoy other numbers/matching games such as Minesweeper, Majong solitare, and Picross. The other game modes look quite interesting to me, but as most of the focus is on Sudoku, I'll likely have to give it a pass. @poppyman: the only ones I have played are puzzle adventure and petpet adventure xD but yeah, they tend to have that "charmingly bad" feel to them. booooooring! I actually like Word Searcher on dsiware lol much cheaper and good enough for me! CrossWords DS is good too. What really annoys me with all the Sodoku games, none of them have copied the Brain Training input method. This is still by far the best entry method.....other games are clumsy in comparison. I’ve always been fascinated by Minesweeper and am still very glad that one day I bought the discounted Mario’s Picross for the GB without knowing anything about it at all. To me the Picross games are the very greatest of this little subgenre and one of the most satisfactory gaming experiences I’ve ever had. While there are various magazines that offer even more different puzzle types I find it a lot more convenient to play ‘em on a console (especially one with a touch screen.) So I’m always glad when there’s new stuff to fit my bill. Ever since I’ve seen the three puzzle types besides my least favourite Sudoku i knew I had to have it one day. So when I could get it for about 12 € there were no second thoughts. Fast forward to about two months later I’ve logged in about 40 hours and am still playing this game for some minutes every day. All while having played most of the Shikaku, Hashi and Akari levels and only about a dozen Sudoku puzzles. So I consider my money well spent. My first impression of the game wasn’t as good though since in some ways the interface is a bit strange, it’s all very bare bones, the animations seem tacked on and worst of all I got the impression that you have to use temporary markers instead of being able to solve the puzzles by nothing else but logical thinking. (A penalty for being wrong could have helped in the earlier levels.) But I got used to the interface, read the tutorials again and got better in the different puzzles so now it’s pure fun to me. It’s not as great as Picross but then again what can be anyway. The review sums it up quite well and I wondered why “you cannot have multiple games going at once” too. I would have preferred to have Shikaku, Hashi and Akari as downloadable games (even as individual downloads) but i’m very happy with my purchase. And while it’s hard for me to be objective about this game a 6 / 10 seems fair enough. Keep in mind that if you really love these puzzle games it could even be a 8 / 10 for you. I’d say so too and it seems to be a good idea to change the title. I’d say everybody that wanted a Sudoku game already has had his fair share of it. I believe it’s reaching a wider audience with the American name. Let's just call it Neopets Pencil Puzzle.